Few sports are as American as baseball, and few roads are as quintessentially American as the Mother Road. But it is fascinating to better understand the actual connection between baseball and Route 66 over the years. Baseball came into existence in pre-Civil War America, in a time when James K. Polk was our president and we were fighting the Mexican-American War. Since the time of America’s independence, roughly 65 years before baseball was conceived, this country had known nothing but conflict. Wars including the American Revolution, the War of 1812, and battles with Native American tribes left our country in a continuous state of unrest as we sought to separate ourselves from Great Britain and expand westward. Perhaps this is why someone felt the desire to invent a game to keep our minds off the constant battle for expansion to the Pacific coast. So, whose bright idea was it to form a diamond of four bases and bring two teams together with just a ball, gloves, and a bat? The long-standing myth that Abner Doubleday invented baseball in 1839 has been debunked by historians, as Abner was at West Point in 1839 and later claimed to have nothing to do with baseball. Baseball wouldn’t make its debut until the next decade. In 1845, a group of men in New York City founded one of the first organized baseball teams: the New York Knickerbocker Baseball Club. One of those men, Alexander Joy Cartwright, set in stone the rules that now govern America’s beloved sport, aptly dubbed the “Knickerbocker Rules,” and included a requirement for baseball players to have the reputation of gentlemen. The first recorded baseball contest took place in 1846. Whether you go to the games for the sport, the peanuts, the beer, or (in this writer’s case) the hot dogs, there is nothing like spending a sunny afternoon sitting behind home plate rooting for the home team. Like baseball, Route 66 holds a special place in America’s heart. Given the nickname of America’s “Mother Road” by John Steinbeck in his classic novel The Grapes of Wrath, Route 66 embodies the spirit of America, much like the baseball diamond. What was happening in the world of baseball the year Route 66 was established? In 1926, the Red Sox finished last in the American League with a club record 107 losses. On September 26, the New York Yankees and the St. Louis Browns (now known as the Baltimore Orioles) played the shortest game in American League history at just 55 minutes. At age 17, the Giants’ Mel Ott becomes the youngest player in the National League to get a pinch hit. Babe Ruth once again impressed the world with a .372 season batting average, 47 home-runs, and 14 RBIs – and during the fifth game of the World Series, Ruth hit one of the longest home-runs in World Series history, estimated at 530 feet. Despite Ruth’s historic home-run, good fortune shone down upon one of Route 66’s home teams – the St. Louis Cardinals would go on to defeat the Yankees after five games to become the 1926 World Series champions. One of baseball’s legends was born just a few years after the Mother Road opened and grew up in the nearby Route 66 town of Commerce, Oklahoma. Mickey Mantle, affectionately known as “The Mick,” played baseball with a semi-pro team in Baxter Springs, Kansas – also along Route 66 – at age 15, before being assigned to the Yankees’ minor league team in Independence, Kansas. It was in Independence that Mantle hit his first professional home-run on June 30, 1949 at Shulthis Stadium. 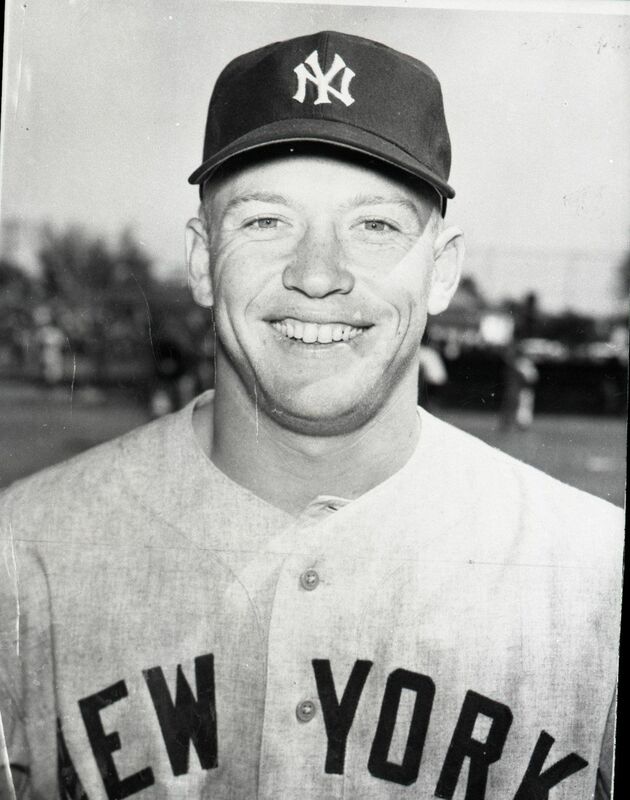 The Mick went on to play his entire 18-year MLB career for the New York Yankees (1951-1968), leaving behind a legacy that will not soon be forgotten. Mantle hit 536 MLB career home runs and won the Triple Crown in 1956, leading the major league in home-runs, batting average, and RBIs. Mantle’s larger-than-life statue, in his Route 66 hometown of Commerce, pays tribute to his life, and fans can also visit his boyhood home which remains largely unchanged by time. Since its inception, baseball has united fans across the country, whose love of hot dogs and 7th inning stretch interludes bring them repeatedly back to the stadium. Yes, rivalries exist – only a brave and true fan would wear a Yankees cap in Boston – but fans from New York to L.A. stand and sing together the renowned words, “Take me out to the ballgame,” regardless of the logo on their shirt. Jack Norworth wrote “Take Me Out to the Ball Game” in 1908, inspired by a baseball sign in the subway. Although he had never been to a game, Norworth wrote the song about a girl named Katie who, rather than going to a show, wanted her beau to take her to the ballgame. Albert Von Tilzer set the words to music and it became a quick hit. It was not until 1934, however, that the song’s chorus made its entrance into ballparks – first at a high school game and later that year during the fourth game of the 1934 World Series. Because of the nostalgia of both the Mother Road and baseball, Route 66 has claimed naming rights over a few parts of America’s pastime. Nicknamed the Route 66 Rivalry, the Chicago Cubs and St. Louis Cardinals, whose stadiums are located just 300 miles from each other, have been rivals since the first time the teams met in the 1885 World Series (then called the World Championship). Chicago and St. Louis are not the only baseball organizations willing to connect their teams to the Route 66 legacy. In 2003, the San Bernardino Stampede, a minor league affiliate of the Los Angeles Angels, changed their name to the Inland Empire 66ers, a nod to the Mother Road running just south of their stadium. In October 2017, Joliet, Illinois, announced new plans for their city-owned stadium to undergo an identity makeover, transforming it into the Joliet Route 66 Stadium. Home of the Joliet Slammers, the newly turfed stadium will be open year-round for baseball games and concerts. Route 66 might be out of commission, but its memory is alive and well – and while baseball is America’s favorite pastime, traveling Route 66 continues to be a tradition almost as beloved as going out to the ballgame.